Trec Boogieman is a complete and very advanced pre-workout formula which contains only safe ingredients with confirmed efficacy. The preparation comprises: beta-alanine, citrulline malate, alpha-ketoglutarate L-arginine, taurine, L-tyrosine, caffeine anhydrous, alpha lipoic acid (ALA), L-theanine, extracts from the root of Korean ginseng and Rhodiola Rosea, magnesium and vitamin B1, B3, B6 and B12. Boogieman rejects the stereotype of harmful and maximum stimulation of the nervous system which is connected with formulations that are taken to stimulate the body before physical activity. The formula contains ingredients which help enhance focus on training and complete successfully its goals. Boogieman meets all standards of high-quality pre-workouts – it does not only have stimulant properties but also increases the body’s energy output. Even though it does not contain harmful and banned substances, the product fulfils its task, i.e. stimulates, maximises muscle pump and enhances focus. Beta-alanine is an amino acid whose main effect is to increase carnosine levels in muscles. Carnosine prevents drops in pH caused by the build-up of hydrogen ions in muscle cells. This phenomenon is largely responsible for fatigue and muscle failure during high-intensity workouts. Beta-alanine improves the body’s ability to remove H+ ions and allows you to extend high-intensity interval training and thus obtain lasting results. To maximise muscle pump, the formulation has been fortified with citrulline malate and l-arginine alpha-ketoglutarate. Both substances stimulate the synthesis of nitric oxide with vasorelaxant properties. This gives your muscles more blood, oxygen, and nutrients, and also speeds up the removal of substances that make it difficult for you to continue exercising at high intensity. Alpha-lipoic acid (ALA) takes part in the biosynthesis of acetyl-CoA – a key substance in energy production, involved also in cellular mechanisms responsible for metabolising glucose for energy purposes and increasing the uptake and utilisation of glucose by cells. ALA has a major role in normal functioning of the body, especially in physically active people, because its endogenous production does not meet the body’s needs. It is reported in the literature that taurine participates in the transport of glucose and creatine to muscle cells and helps maintain the body’s water-electrolyte homeostasis, thereby preventing dehydration. It is worth mentioning that even small fluid deficits may impair considerably the body’s physical performance and exercise capacity. Even though the body synthesises taurine, these amounts are not sufficient to satisfy its requirements, especially in physically active individuals. When it comes to their nutrition and supplementation, L-tyrosine is used as a psychostimulant, reducing fatigue and increasing physical performance. What is more, it promotes well-being and increases levels of dopamine, adrenaline and thyroxine which are essential to full energy mobilisation of the body. Caffeine anhydrous is a classic ingredient of pre-workout supplements used to stimulate the body. This form of caffeine is characterised by easier absorption and thus higher potency. The mechanism of action of caffeine is to, among others, block adenosine receptors, reduce symptoms of fatigue and increase motivation and stimulation. What is more, taking caffeine before a workout has a beneficial effect on oxygen balance and increases exercise capacity. L-Theanine is a psychoactive substance derived from green tea which has a soothing effect on the nervous system, promotes relaxation and improves cognitive functions. It has nootropic properties which help enhance your performance while calming you down and improving your mood. It is worth noting that L-theanine does not impair brain function and cause drowsiness. Korean ginseng root extract is used for physical and mental fatigue. It has alsothe ability to reduce overstimulation caused by stimulants, improves physical performance, supports the immune system and helps maintain the body’s health. Ginsenosides found in the root improve the oxygenation of bodily tissues and thus promotes training performance. Owing to antioxidant properties, it inhibits the formation of free oxygen radicals. According to studies, rosavins present in Rhodiola Rosea root extract have positive effects which lead to a reduction in fatigue and allow you to enhance your performance. Rhodiola Rosea belongs to adaptogens, namely substances which increases the body’s resistance to excessive stress. Magnesium is involved in, among others, carbohydrate, protein and fat metabolism, glycolysis, fatty acid oxidation, creatine breakdown and production of the high-energy ATP molecule. Thiamine (B1) works with thyroxine and insulin, participates in carbohydrate metabolism and stimulates acetylcholine activity, which improves the functioning and regeneration of the nervous system. What is more, it is a component of many enzyme systems in tissues and stimulates the secretion of gonadotropins. When energy expenditure is higher, the body’s demand for this vitamin increases. Because of that, its adequate intake is important to very physically active individuals. Niacin (B3, PP) promotes the metabolism of nutrients involved in the production and release of energy, takes part in the formation of erythrocytes and reduces negative effects of various chemical substances and drugs. It influences also beneficially the whole nervous system and mental health. Since it shows vasorelaxant properties, it is a perfect ingredient of supplements which improve muscle pump. Vitamin B6 contributes, among others, to an increase in the body’s immunity and maintenance of normal metabolism of energy nutrients. It is also critical to the synthesis of heme and erythrocytes. In addition, it promotes well-being and mental health. Vitamin B12 as the active coenzyme dibencozide helps regulate metabolism, takes part in gluconeogenesis, snd stimulates and speeds up processes of formation of new body proteins. Dibencozide is added frequently to supplements which promote metabolism and increase appetite and muscle anabolism. In addition, vitamin B12 has a beneficial impact on the production and function of red blood cells which supply oxygen to all body cells. Better oxygenation of muscles improves their efficiency and helps enhance the body’s performance. 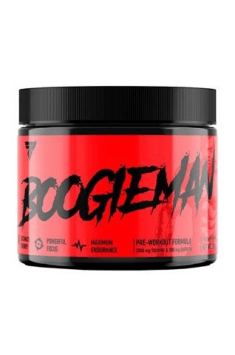 To sum up, Trec Boogieman is a revolutionary preparation which breaks once and for all the stereotype of pre-workouts that overstimulate the nervous system. The content of tested and extremely effective ingredients improves your fitness and helps you increase training intensity. The product is designed for physically active individuals, athletes who want to break down barriers and also those who struggle with a decrease in energy and motivation for training. Dissolve a single portion of the product - 20 g (3 scoops) in 300 ml of water using a shaker. The product should be used for 30 minutes before planned training. Take the product preferably on an empty stomach because its active ingredients will not compete for absorption with food in the digestive system. Avoid combining it with other products that contain caffeine. Do not take it at bedtime. Anti-caking agent - silicon dioxide; fragrances; maltodextrins, thickeners - cellulose gum, xanthan gum, sweeteners - sucralose, sodium cyclamate, sodium saccharin. The highest source of branched side chain amino acids in optimal proportions 2:1:1.